UNDEROATH will be embarking on their "Erase Me" tour this fall. It is the band's first major market headline tour in support of their new album Erase Me (Fearless Records), which recently debuted at #4 on the Billboard Top Album Sales chart. The tour finds UNDEROATH returning to many markets they previously sold out on their incredibly successful Rebirth Tour. In addition to playing multiple shows in several markets, the tour will see the band performing at landmark venues, such as The Shrine in Los Angeles. UNDEROATH will close out the tour with their first-ever headline arena show at The Sun Dome in their hometown of Tampa. This date serves as the band's sole appearance in its native Florida this year. 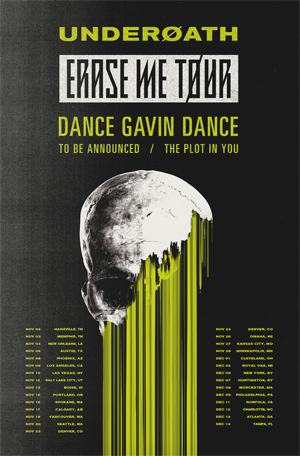 Joining UNDEROATH for this "can't miss" trek are DANCE GAVIN DANCE, who recently debuted at #15 on the Billboard charts with their new album Artificial Selection, and labelmates THE PLOT IN YOU. In August, UNDEROATH will be announcing the final band to appear on the tour. "We're dang excited to finally announce the Erase Me U.S tour," UNDEROATH's Chris Dudley said. "We're bringing along DANCE GAVIN DANCE, a special guest that we think people are going to be pretty pumped on (patience! ), and THE PLOT IN YOU. We've also already started working hard on the show itself to make it something unlike anything we've done before. So, between that and the lineup, this is basically gonna be insane." Fans will also have plenty of opportunities for band experiences on this run. VIP Meet & Greet packages will be available and soundcheck performance parties will be taking place. UNDEROATH will also appear on three dates of the final cross-country Vans Warped Tour, as well as at other key summer fests.